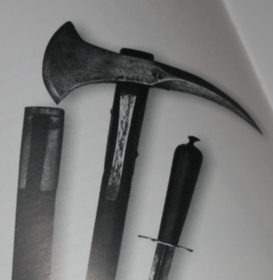 “Storia Dell'Arma Bianca Italiana” by Calamandrei, shows an axe very similar to the French model, but with a smaller blade and longer spike as part of the naval arms issued to Sardinia Piedmont forces, before the formation of what we now call Italy. This study would be incomplete without including reference to the Boarding Axes of some of the other nations that had significant sea power during the age of sail such as, the Italian States, Imperial Russia and the Ottoman Empire being chief among these and perhaps to a lesser extent the Austrian Empire and Prussia. This is work yet to be undertaken and included here is some initial content only. Prussia concentrated on maintaining the power of its army and did not start developing its naval force until around 1848. It swiftly expanded its small coastal fleet to a naval power that eventually formed the basis of the German Imperial Navy at the unification of Germany in 1871. This axe shows characteristics of a mid 19th century boarding axe with the reduced emphasis on spike but is so far the only identified example.